There are 10 candidates available for marriage if you are playing as the male main character. In order to get married you have to raise the person up to at least 9 hearts, view the events that trigger as you increase the number of hearts with that person, own at least a level 2 house, and get the blue feather. At the love confession event (at 7 hearts or so) your positive response to being told about the girl's love for you will lower affection with the other marriage candidates! This lovely lady helps her parents Ruth and Craig over at Marimba Farm. She will not be available until after you have chimed the Yellow Bell and restored the power of earth to Castanet. 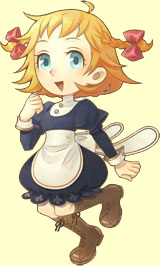 After she returns, you can find her inside the farm shop most of the time. 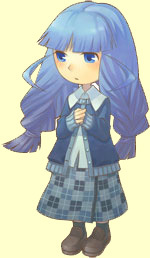 All dressed in blue, Candace is a very shy girl who works with her sister Luna and grandma Shelly at Flute Tailor. Most of her time is spent inside the shop. On Sundays when she is not working, you can find her in and around the Chelsta Church between 11:00 am and 6:00 pm. The Goddess watches over the divine tree at the Goddess Pond, but now the tree has wilted and she is in need of help to revive it. 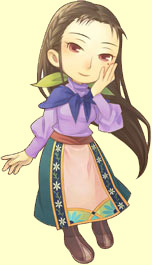 Once you finish the main plot of the game and revive the tree, you can give the Goddess gifts and eventually ask her to marry you. The Harvest Goddess only has events at 4 hearts and 7 hearts. Kathy helps her father, Hayden, with his Brass Bar in Harmonica Town. She waits tables and brings the customers the drinks they order. Since the bar does not open until 4:00 pm, you can usually find her outside the bar's doors or at Flute Tailor if the weather is bad. Candace's little sister, Luna, arrive on Castanet with their grandma after you complete the Blue Bell. 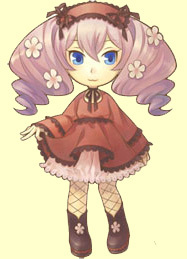 She is much more outgoing than her sister and sometimes she may seem to be a little rude. Luna has grown quite a bit from Tree of Tranquility and is now the same height as all of the other girls. Maya helps her parents, Jake and Colleen, run the Orcaria Inn in Harmonica Town. She loves to eat and always is asking if you've been eating enough. Unfortunately Maya isn't a very good cook herself, but her grandma Yolanda has been tutoring her in the culinary arts. The daughter of Barbara and Simon, this inventor likes to spend time looking around the Garmon Upper Mine or in her room working on different projects. You have to chime the Red Bell before you can go into Garmon Upper Mine and unlock her on floor 5. 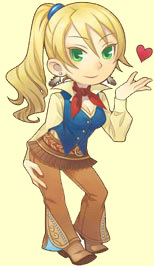 Renee likes to work at her parent's Horn Ranch, where she takes care of the various animals they have. 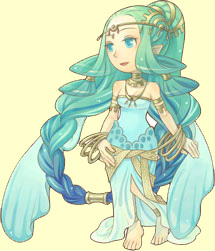 She also has an interest in fishing, and will spend her Wednesdays fishing off the bridge in Flute Fields. Once you ring the Blue Bell and gain access to Pascal's boat, you can take it to Toucan Island where you'll meet Selena. 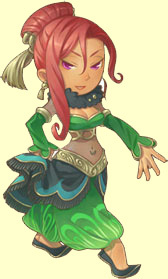 She'll stow away on the boat when you return to Castanet and gets a job at Hayden's bar, where she becomes a dancer like she's always dreamed. The magic caster lives in the very depths of Fugue Forest. A wayward spell from the Wizard has trapped her in an unsightly form, and you have to restore her body during the task of chiming the Green Bell. Witch is easy to befriend; on your way to her house you have to go through Fugue Forest, where you'll find a Fugue Mushroom each day to give to her. 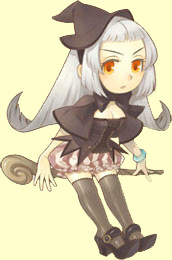 When you have increased the number of hearts Witch has to 3 she will start making a seasonal request that results in a gift for you. Fall: Rice Ball and Vegetable Sandwich. Reward is 9 Morning Glory seeds and 1 Shining Wool Thread. Winter: Egg Soup. Reward is 1 Cherry Tree Sapling and 9 Watermelon seeds. She will only ask for the item(s) once per season, so you need to know about her request ahead of time and have the item ready in your rucksack. If you triggered the seasonal request, leave to get the item, return, and then try to give it to her outside of the event, she will just accept it as a normal gift. The food that she requests can simply be purchased at the Oricana Inn or made using your own kitchen.